Spring is on its way at last! While the temps can vary wildly this time of year, the good news is that all weather is perfect for reading. Whether the sunshine has you outside soaking up warmth, or the rain suggests you stay indoors (seriously, we have had SO MUCH RAIN in Nashville), our booksellers offer some favorite reads to keep you company. I know this has been recommended before, but Min is coming to the store on March 21, so now would be the perfect time to dive into this wonderful multi-generational saga if you haven’t already. It’s one of those books you can’t put down. Read the opening scene and you’ll be hooked on this twisted thriller. Can we really believe this woman as she narrates her story? Told from the perspective of Lorena Hickok, this is the great hidden love story of the Roosevelt era. Eleanor Roosevelt’s ambivalence, a country in crisis (first the Great Depression, then WWII), the complicity of FDR, and the mores of an earlier time create the perfect storm for a complicated, heartbreaking story — but with some small redemption in the end. I wasn’t sure about this historical novel while reading it, but I haven’t stopped thinking about it since I finished. A photographer accidentally catches a tragic moment on film and has to decide what to do with the artistically perfect — but disturbing — photo that results. If you enjoyed Edan Lepucki’s Woman No. 17 and Claire Messud’s The Woman Upstairs, you might dig this new novel about art, ambition, and what we do (or don’t) owe our friends, family, and neighbors. This novel is about everything big, told in the miniature, heart-wrenching tableau of a census. We are grazed by the notion that something is a bit different in this world, breathing down our necks. Sentences inspire double takes, characters jump from the page into life, and a transformative journey is undertaken for both the reader and the characters. You’ve probably heard about Exit West. It was a Parnassus First Editions selection, several of us chose it as our staff recommendation, and it racked up big-time recognition — such as being named a finalist for the Man Booker Prize and the National Book Critics Circle Award. It’s finally out in paperback, so if you haven’t read it yet, I urge you to devour this slim but gorgeously realized love story that couldn’t be more timely. Lyrical and heartbreaking. Pearl and her mother have always lived in their car with the few other inhabitants of a Florida trailer park. Amid their day-to-day living, events take place that drastically change Pearl’s life. In case you missed it (like I did), the powers that be have just re-released Jesmyn Ward’s debut novel. Pick this up for more necessary reading if you loved Sing, Unburied, Sing. A Cold War thriller about two brothers. Frank Weeks is a traitor living behind the Iron Curtain and writing his memoir. He lures his brother Simon, a New York publisher, to Moscow to edit the manuscript. Kanon is one of the true masters of the spy novel writing today. This one’s out now in paperback. A fantastic debut novel. Cleveland’s time working counterterrorism in the CIA is reflected in her writing. This book will grab you and keep you riveted until the final page. I Kill Giants is a stunning look at grief and the power of stories to heal our wounds. I am still completely in awe of this collection and recommend it to anyone and everyone. Early bird? Night owl? Ever wonder when is the best time to break bad news or pop the question? This book about perfect timing is smart and loads of fun. A while back I introduced Balko at his book event here at Parnassus and listened raptly as he spoke of his passion for justice for those who’ve been wrongly accused. If forensic science fascinates you and you love a story of brilliant folks helping those without a voice, this is the book for you. Bishop Spong is the reason I am a Progressive Christian. I heard him speak at Sewanee 25 years ago and have been asking the hard questions ever since. He says this is his last book, but if you haven’t read him before maybe this should be the first book of his you pick up. I read a lot of books about escaping cults. They just seem to land on my desk. This story is so much more — an eloquently decribed inner struggle surrounded by violence and despair. One of the best things about this job is that customers give you THEIR best recommendations. This is laugh-out-loud funny. I was cracking up from page one. This is a unique collection of essays on topics ranging from climate change to social media, fine art, and more. If you like art, dance, politics, or films, this is for you. There truly is something for everyone here. A little-known WWI tragedy that forever changed U.S.-Canada relations makes for such a compelling read. This one comes recommended by my husband, Steve Schultenover. What a brave memoir. Bowler, a theologian who teaches at Duke Divinity School, is diagnosed at age 35 with stage-four cancer. This book is her meaning-making. I read it in one sitting and was ugly-crying and laughing at the same time. Think When Breath Becomes Air in conversation with There Is No Good Card for This. When you work in a bookstore, you get handed a lot of advance copies of books. For me, these mostly end up in well-intentioned-but-oft-neglected stacks around my house. But sometimes, when an early copy lands on your desk, you just know it’s going to be special. When I pulled Anatomy of a Miracle out of the mail stack, it didn’t even have a cover yet. It was just a boring old black and white bound manuscript, with a curious little asterisk in the title. But I loved Jonathan Miles’ previous novel, Dear American Airlines, and had a long flight for which I needed a good book, so I tucked it in my bag. What I discovered in its pages was unlike anything I’ve ever read before. It’s a novel, sure, but it reads as a Jon Krakauer-esque reporter’s investigation into 26-year-old paraplegic veteran Cameron Harris’ miraculous healing in the parking lot of the Biz-E-Bee convenience store. It’s a brilliant blending of fact and fiction, a magical meditation on modern medicine, religion, reality TV, and humanity itself. I loved it, I got lost in its pages, and I could not put it down. In short, it’s one of the best novels I’ve ever read. I hope you’ll love it, too. Thursday, March 22 at 10 a.m.
Thursday, April 19 at 10 a.m.
Monday, April 2 at 10 a.m. and 6:30 p.m.
Every month at Parnassus Books, we receive dozens of ARCs (advanced readers’ copies) of upcoming releases. As a staff, we are encouraged to read as many as we want, to be able to give feedback to publishers and be able to recommend them to customers when they are released. I have to admit that some of the ones I take home I set aside after reading 20 or 30 pages; I can usually tell whether or not a book is for me. This month I found a real winner by an experienced writer, an unusual love story that has stayed with me. White Houses by Amy Bloom (Lucky Us, Away) involves the true story of Eleanor Roosevelt and her friend, the reporter Lorena Hickok. As you can see in Keltie’s staff pick above, it’s told by “Hick” in her unforgettable voice, and it chronicles their relationship from their first meeting in 1932, when Lorena was assigned by the AP to cover the First Lady. As time goes on, their connection deepens into close friendship and eventually passionate love, lasting for the rest of their lives. Flashbacks from Hick’s childhood and teenage years, tales of her trips with Eleanor, and scenes of living in the White House and befriending Franklin Roosevelt make for great historical fiction and a worthwhile book club selection. This unique story of unconventional love is guaranteed to spark lively discussions. Speaking of awards: congratulations to the winners of the PEN America Literary Awards! Ask the nearest bookseller where you can find these titles. Love reading about reading? Don’t miss the latest bookish news at Lit Hub, as well as Humanity Tennessee’s online book mag, Chapter 16. 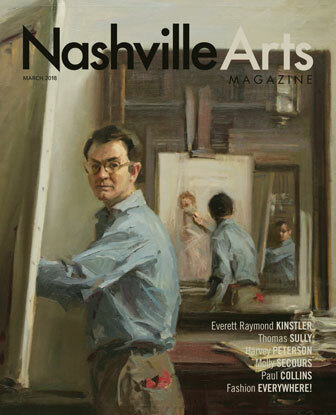 And as always, don’t miss our monthly roundup of great reads in the Bookmark column of Nashville Arts Magazine. Coming up next on Musing: more fresh spring books — this time for kids and teens!